Mystery creates wonder and wonder is the basis of man's desire to understand.Flewro is one such wonder coming soon from flewup. The term Flewro Stands for Flying Electronic Wonder Robots.Flewro will be a Wireless Infrared IR Flying Robot Robocopter RC Radio Remote Control iPhone iPad iPod Android Tablet Smartphone Controlled Gyroscopic Stability Controled Device.which can even pluck the coconut from coconut tree.And it can be used for 18 different purposes You can fly the device as well as control its camera from your smartphone (connected via Wi-Fi) and receive live images, which can be stored directly on your smartphone. Aliriza Abdul Gaffoor is the person behind this innovative product called FLEWRO. He was lead to the making of this drone to pluck coconut, due to the unavailability for workers to pluck coconut in his native place – Kannur, Kerala, India. His thought was inspired by the remote controlled toy drones available in market. 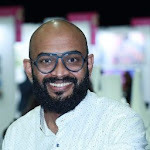 He had this idea in his mind for past two years, now it is going to be launched with the help of Startup village, Kerala. 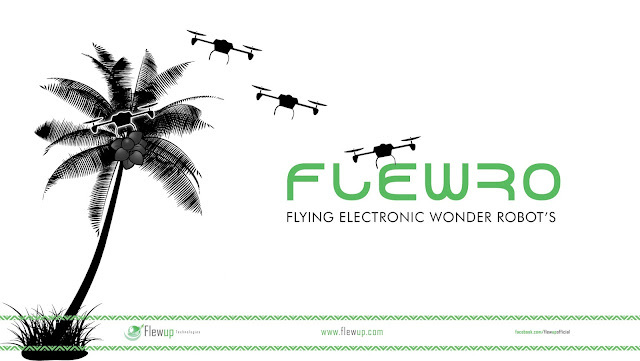 Aliriza Abdul Gaffoor has formed a company named Flewup Technologies for further development of the robotic drone. Now about 230 engineers are working on this project. CafIT – Calicut is also helping Abdul Gaffoor to complete his dream project. Three major IT companies has already shown interest in FLEWRO technology. It is expected to be launched in market within next 3 years, in a price range which can be afforded by common men. The drone will be featured with voice based control system soon. This drone can also be used to pluck dates from date palms in middle-east countries. Other than plucking coconut or other fruits from trees, FLEWRO can perform 18 other functions like handling tasks to maintain air conditioners, painting, electrical works etc…of high rise buildings.